What a wonderful weekend getaway! The kitchen is perfect for whipping up a relaxing mean. Drove to Deep Creek Trails. We will be back in the area to explore again and we will be staying here again. Came from Jacksonville FL with my husband. the long drive was well worth it! Wonderful cabin and view. Saw a fox, beaver and a wild turkey ( not all together though). - My husband and I cannot thank you enough for opening up this beautiful home to share it with us. We celebrated our first anniversary here, and have more memories to last us a lifetime. We are already talking about a return visit in the Spring! Thank you again for allowing us this opportunity. Awesome cabin! We have been blessed by the awesome mountain views. This cabin is the cleanest best equipped rental we have ever experienced. Great Place we will be back. We arrived late and went to the wrong cabin, our fault, called and got help late in the evening. also someone came out to start the fire place that we were having trouble starting. 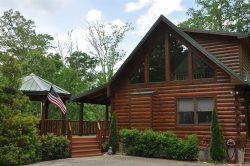 The team was very courteous and knowledgeable about their cabins and the surrounding area. I called on several occasions with questions and I received a credible answer in a timely manner each time. We stayed in the Smokey Mountain High cabin. The cabin was immaculate and the view was unbelievable. There were 7 people in our party, but with four bedrooms and 4 1/2 baths we all had our very own private space. It was the best of both worlds - together time and private time! We were very pleased with the cleanliness of the cabin and how were stocked it was. Anything we needed was there! We were looking for something specific and found it in your cabins. Also, the website was nicely done and easy to navigate, ad provided details about the property without having to call. Loved Bearadise! Beautiful view of sunrise each morning. Enjoyed the cozy cabin and the mountain fresh air. Put together a 1000 piece puzzle!!!. Went from snow on day one and sunny and 60 degrees. Nice fall temps. Don't want to leave but we will plan to come back. Great correspondence and provided easy to follow directions and instructions. This was the first time my wife, Kinsley, had visited the NC mountains and your cabin was the perfect place to enjoy the entire experience. Was incredibly hard to leave on check out day, this was truly one of only two places we've ever stayed where we said we wished we'd have lived. Loved the comfort and lived in feeling of the entire cabin. It wasn't a typical sterile environment, it felt like a real home. Clear and responsive. They leave no question as to the process. Wonderful time of the year to be in the mountains. The weather and foliage was perfect and the cabin was comfortable and in the middle of it all. We had a wonderful time. The cabin was very clean and the people at GSCR were great. We will certainly be back. We rode a 3 wheel motorcycle from Tampa, FL. The scenery here is breath taking. Coming here in peak season has been one of the nicest experiences that we have ever shared together as a couple. The calm and peaceful views, the beauty of the fall colors, and the cozy cabin - such a wonderful place. Thank you for allowing us to walk and experience the beauty of these mountains. No words can describe the time we have had this week in the cabin. The views of the mountains and the proximity to the local points of interest made this trip! Thank you for sharing your cabin with us! We look forward to coming again next year! The people we talked to on the phone were very accommodating and friendly. Thank you! Our stay at Paradise Valley Lodge far exceeded our expectations! Of all my vacations, I've never stayed in a more well-kept and stocked place. Everything you could think of was provided from the kitchen to the bedrooms to the bathrooms to the living room/dining area to the recreational rooms downstairs. This is a perfect place for large families. We definitely desire a second visit! Next time we'll try the summertime. The entire process was easy, convenient and fast. Our cabin was everything we hoped for and more. The feel and atmosphere are welcoming. Came with all the amenities that met our needs and wants. Most of all, we had a beautiful view. We will be returning in the near future. Thank you.